While we're talking about Super Mario Galaxy 2, I thought I really should ask about the sound as well, so I've had you all gather here. Thank you very much. I'd heard there were no such plans this time, and I was feeling a little neglected... (laughs). You're right, it sounds as if there were no plans for this at first. I wanted to ask about it myself, though, and my proposal may have brought it about (laughs). The “sound of Mario” is widely known by people the world over; even in the field of game music, it has a long history. Every time you come up with a new proposal, at the same time, you have to make sure you properly continue the existing tradition; I think that must be a lot of pressure. And then this time, as in the previous game, you had orchestral recording done. I'd like to ask about that, along with various other things. Thank you in advance. All right then, I'd like you all to introduce yourselves, and to tell us a bit about what you did. 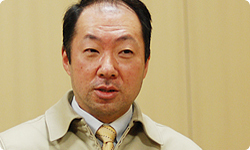 Let's start with Kondo-san. 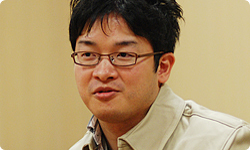 I'm Kondo, from the Entertainment Analysis & Development Division. This time, as on the previous work, Mario Galaxy1, Yokota-san acted as sound director, and I was in charge of several tunes. 1 Mario Galaxy is Super Mario Galaxy, a platform game released worldwide for the Wii console in November 2007. So Yokota-san put together the sound as a whole, and you stood in the background watching over him, and also did a bit of work yourself. Is that about how it was? That's right. I also acted as a supervisor of sorts; I was in charge of listening to all the finished tunes and deciding whether or not the music “fitted” with a Mario game. All right, Yokota-san. Your turn. 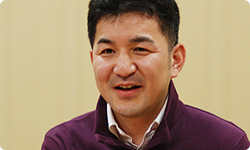 I'm Yokota from the EAD Tokyo Software Development Department. I was the sound director for the previous work, Mario Galaxy, and I held the same position for this game. We wrote a lot of new music for this sequel, so... I hope everyone listens to it a lot. You mean, even though it's a sequel, it doesn't feel as if you just recycled the music from the previous game. That's right. Actually, Miyamoto-san told us we were working too hard. He said, "If you people are left to yourselves, you'll try to do everything in a new way, but there are players who loved the music from the previous game and are looking forward to hearing it." So he told you not to throw away absolutely everything. No. He said, "What do you think you're trying to do, making it entirely new!" Of course it's important to protect tradition, and we want to do right by the players who liked the previous game. But then, there you are, caught between that and the fact that there's no fun in making a game just like the old one. What do you do? lots of completely new tunes . I think we managed to come up with a really substantial soundtrack. 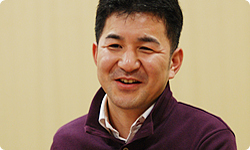 I'm Nagamatsu from the Entertainment Analysis & Development Division. 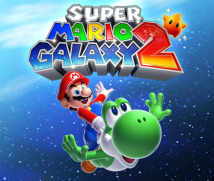 I joined the project from this Mario Galaxy 2. It's been four years now. Before Mario Galaxy 2, I was involved with the sound for New Super Mario Bros. Wii2. 2 New Super Mario Bros. Wii: An action game released in Europe in November 2009 for Wii. So, one "Mario" game after another. All right, then. To begin, from a composition perspective, can you talk about how you got started on Mario Galaxy 2? This may have already been discussed during the previous "Iwata Asks", but this project began with the idea of using property from the previous Mario Galaxy and making a "1.5" version, so at first we weren't sure we'd be changing the music at all. You mean you'd use the previous game's terrain as-is, and keep the music the same as well? That's right. But then, first, the designers started working very hard, and they turned out lots and lots of new pictures. So everyone worked hard, trying for more and more. Exactly. While we were all thinking "work harder, do more", this new world began to materialise. Most importantly, the fact that the background was blue sky figured in a big way when we were thinking about the melodies. Yes, Miyamoto-san was quite moved. He said "Yes, when you think Mario, you think blue sky". He said, "It's fine to have Mario flying through the cosmos, but if that's all there is, it isn't much like Mario." As I listened to him say that, it was hard to stop myself from pointing out, "But it was you who set the game in space in the first place, wasn't it?" (laughs). (laughs). Then we decided to put Yoshi in too, and we started to look for fresh, lively music that would fit that world-view, with that blue sky as the background. So you took the design into consideration when you were thinking up tunes. That's right. Then, while thinking up tunes that would suit that blue sky and Yoshi, I started to understand, deep inside, just what was important in "Mario" music. By which you mean, when you wrote the music for the previous game, you didn't know what was important with regard to "Mario" music? I was very, very nervous while I worked on the last game. The previous game was the first time you'd dealt with "Mario" music, wasn't it? I understand why you'd feel "very, very nervous", but by the end, you seemed as though you'd really started to get the hang of it. Even watching from the sidelines, I could tell Kondo-san trusted you. At the time, though, I really was finding my bearings. However, on this second game, I started to figure out, "This is what 'Mario' music is like". I mean, to begin with, people who play Mario all say, "It's even fun just to listen to the music". So I started to think that the sort of music people wanted from a Mario game was the sort that would cheer people up when they listened as they were playing, the kind that makes you happy in spite of yourself, until you can't help but smile. I agree. When I was writing music for “Mario”, I was always very conscious of wanting to make every tune more cheerful than the other music. But on the other hand, I also kept the fact that it was Mario Galaxy firmly in mind. I think it's important to keep that balance. Blue sky showed up in the background of the game's main visual, and we just wrote a lot of fun music for it. And then the response we got was different. You mean the team's response? First the team's response, yes. Then the people from the Mario Club3 and Nintendo of America also gave us a really solid response. In the first instance, with series games, it's hard to surpass the previous work. 3 Mario Club, Inc. conducts testing on Nintendo software during development. Of course, there is that pressure of struggling with the previous game. That's it. In the previous work, we took the approach of pushing a "cosmic view of the world" to the forefront, but Yoshi also shows up in this game, and so we tried to write music around the concept of "the fun of adventuring through the cosmos". And then we got lots of fun comments that we'd never heard on the previous game, such as "I went into the same galaxy again because I wanted to hear this tune one more time". So you wrote tunes with the idea that Mario tunes should be fun just to listen to, and you got a really good response from it. I did. And we got a video of the orchestral recording session; I really wanted you to have a look at it. You also showed the recording of the orchestra for the previous game. 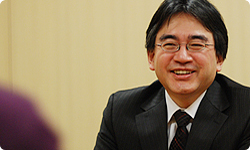 To tell the truth, one of the reasons I decided to do this Iwata Asks was because I wanted to see this (laughs). (laughs). By all means, please take a look.